UPDATE: iOS 7 beta 4 is now ready to download and install, read more about this here where we reveal a few new features. The iOS 7 beta 4 release is expected to be today at 10AM PDT, but this still remains a mystery because the latest developer update status page still asks for your patience. It does say that certificates, identifiers & profiles, software downloads and other services are back online. So now is the time for the iOS 7 beta 4 countdown for release. Will Apple release iOS 7 beta 4 today? Good question really, we actually thought it would have been last week, but then some hacker decided to put the chain in the works and slowed everything up for Apple. Phones Review will be on top of this today waiting for the release of iOS 7 beta 4, any news we get you can bet your bottom dollar we will notify our readers. If Apple does decide to release iOS 7 beta 4 at 10AM PDT, what new features etc are you expecting? A few of our readers on previous iOS 7 beta articles have said they would like to see smarter keyboard options with Note functionality, offline Siri and dictation, how about new features such as multi-window support for iPad and even more camera features on the iPhone. It is kind of crazy when users complain about iOS 7, obviously not by developers because they know it is in beta and problems will occur. The complaints usually come via UDID bypass users, who got the new operating system through the back door. The OS will be buggy and problems will continue until public release in September, so be patient and enjoy whilst you can because we have a feeling Apple will stamp back door access out on its new security update within beta 4 or final release. 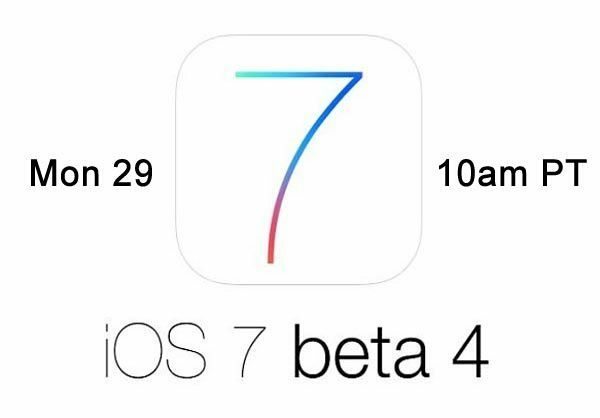 Please stay with us today because we will let you know if iOS 7 beta 4 goes live today, in the meantime let us know what expectations you have? They won’t be able to stop the back door method in all likelihood, because it’s been there ever since the iOS 5 days, if not earlier. or you just shouldn’t be using pre-release software against the terms of the NDA under which it is distributed. if you care that much, drop the $100 on the ADC membership. hell, since you’re gonna sink $100, maybe you’ll take the time to learn how to program. If you think I’m going to pay $100 for the BETA version of software, you’re out your goddamn mind. All I want to do is try out the software. F me right? Fine, but you have to understand you’re playing in apple’s amusement park, and they set the rules. There is technically an NDA protecting pre-release versions of iOS, and it’s against the rules to be distributing the ipsw files to people who aren’t a part of the ADC program. You can’t really complain when they opt to enforce the rules more stringently. How about you not worry about what other are doing. Didn’t your parents teach you that? Must have been one of the slow kids in school. I have spent the $100 and would like to see beta 4 as soon as possible. So what kind of smart remark are you going to say to me there smart guy. Troll the kids sites loser and leave this one to the grown folks. Excuse… me? I’m not worrying, I’m remarking. If you don’t want to run the risk of having your device bricked by UDID registration requirements, you should go through the right channel. If you have spent the $100, congratulations. You have avoided the potential for having your device disabled by UDID authentication. Pat yourself on the back, you’re clearly a stellar individual with much to offer the world. Where you get this garbage about devices being bricked? Please site the sources. If not its all speculation. I never said the devices are going to get bricked. Previously, during older betas, apple did enforce UDID registration. Right now there’s an unfixed backdoor, but there’s always the risk of it being closed. I have no information about whether or not they’re patching it, I’m just saying that it’s always a risk you run installing betas without a proper ADC account. Things happen, mi amigo. No problemo. They would never disable a device. Yeah they might not let you download the latest beta, but “bricking” is unheard of since 2007.
doubt it. you’re likely just a sanctimonious tool. professional developers tend to have better grammar and spelling. I should have better grammar ? Sorry , I figured I’d stick to middle school English so everyone can understand me. Bravo, you used a big word !! Did you end up on Google searching … What are big words I can use to look smart. You bring some valid points indeed. I am a developer and it upsets me to see end users trying to look cool by flaunting an unreleased OS. However I see no validity of your claim that iOS 7 beta 4 will “brick” unregistered users. I guess we will see very soon…. You seem very tough over a keyboard and mouse. When I go to software update it says my software is up to date. Why am I not able to download beta 4? As you can see from the picture above, it is not yet 10am Pacific Time. Plus, this release is not even a sure thing. Apple doesn’t release this information. Hey Craigod, i have the same problem with my iphone, did u find a way to fix it?? I am a registered UDID user and I even know beta software have some problems. Hence the word “BETA” anyways I would to see apple actually add a send button to keyboard. I think it’s about that time the do something different..
iOS 7 Beta 3 has 0 Bugs on iPad…I am downloading iOS 7 BETA 4 right now!!! Downloaded, preparing the update now! Did anyone successfully updated without a registered UDID? I did. First Time it failed. I had the Connect to iTune because i must of bump my computer so the usb go d/c. I had to restore to 6.1.3. After that, I open iTune and hold shift and click on “Restore iPhone” and chose the ios 7 Beta 4 ipsw file. It work afterwards. Hope this helped. my iphone keeps saying software update failed.any 1 els get that?and how to get it? Mine failed too. I had to restore back to iOS 6 and I lost everything. I’m now trying to find a direct beta 4 download. I don’t have a registered UDID, can I update over-the-air from beta 3 to 4 without complications? I just did it, go ahead! mine keeps saying its up to date! but i havent updated it yet! please help! Steve Jobs is dead , Bill Gates and Rich Ferry is not and they are in charged of any innovations that they want so dont be surprise why Apple keeps updating and when it will be available to your devices! is your udid registered or no? Plenty has changed from beta 3 to 4. The lock screen arrows are now straight lines, there’s an arrow pointing right to the left side of ‘slide to unlock’, the appearance of Spotlight Search has changed, shuffling all the songs of an artist is back (though, oddly enough, if you just select a song from an album list, it still plays all the songs of an artist, complicating listening to just one album and restricting that feature to only the ‘Albums’ tab), Reminders has a search, the Decline and Answer buttons have changed (even though you still can’t decline a call when your phone isn’t being used, something I doubt Apple just failed to notice and I really hope is not something they plan to keep that way in the final release)’. Plus, on my devices, it’s actually more buggy. My status bar keeps leaving itself into landscape while I go back to the home screen and stays that way before I lock and unlock the screen. Better IOS so far. Few little changes and better network recetion and some other improvements. Really liking it. Just updated to the beta 4, and my phone will not power on?! It is charged (full) and whenever I attempt to restart it, it shuts off againâ€¦please help asap! happened with me while trying out the 1st beta of ios 7 after 3-4 restarts, but in my case it was ipad 4th gen instead of iphone. couldn’t use the os further due to the problem,, reverted back to ios 6.1.3 by DFU mode. try the DFU mode to revert back and try out ios 7 upon its final release, cz BETA versions are prone to such crashes.